Koschei the Deathless is a villain in Slavic folklore, often portrayed as an abductor of the hero's wife. Though a description is never given in any existing stories, many artists portray Koschei as very old and skeletal looking, as his name shares the word Kost, for "Bone". Koschei has the title of "The Immortal" or "The Deathless" because he cannot be killed by traditional means as he has his soul contained in perhaps the most insane array of items around. Now, bear with me, its going to get weird. Koschei's soul is contained within a needle, that is in an egg, which is in a duck, who is in a hare, that is locked in a chest, buried under a green oak tree, on the Island of Bunyan in the ocean. As long as it there, Koschei can never die and even if an adventurer seeks it out, the challenges are numerous. For if you unlock the chest, the hare will run. If you slay the hare, the duck will fly out and away, but should you conquer all these challenges and obtain the egg, Koschei will be forced to serve you. Hell will grow weaker and lose the use of his magic, and if your toss the egg around, Koschei will be flung as well. If you break the egg and the needle within, Koschei will die. The story is that he was an evil man imprisoned by the Warrior Princess, Marya Morevna, who marries a young man named Ivan Tsarevitch, a young traveler who left home after his parents passed away and his sisters got married. After a while, she tells Ivan she is off to war and instructs him to not open the dungeon door while she is away. Tempted by curiosity, Ivan opens it to find Koschei, chained and heavily emanciated. After giving him water, which restores his magical powers, and he breaks the chains and escapes the castle. Ivan finds out that Koschei has abducted Marya, which leads Ivan to give chase. Upon encountering Koschei, Ivan is killed by Koschei and tossed into the river. He is revived by his sister's husbands, powerful wizards who can transform, and inform him to seek out the Baba Yaga for a magic horse to fight Koschei. After enduring the Baba Yaga's challenges, Ivan gets the horse and fights and defeats Koschei. His story shares similarities with a villain from Serbian folklore, the Bas Celik ; the hero has to wait until his sisters are married before leaving his home, has a wife who forbids him to enter one room, finds the villain as a prisoner until he is given water to replenish his powers, escapes, abducts the protagonist's wife, kills the hero during battle who is saved by powerful in-laws, until they are ultimately killed. The differences, one has metallic wings and grants the hero three lives, and one is a living skeleton who gives the hero a chance to leave before killing him. 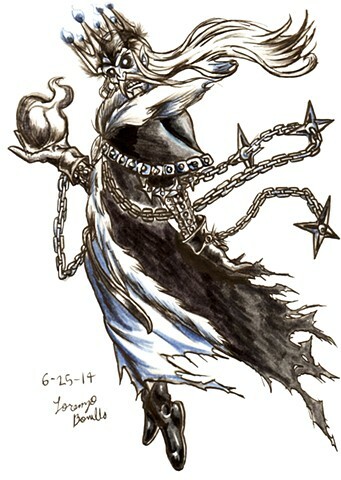 For my depiction, I portrayed him as a powerful lich wizard with chains hovering around him, and a spectral crown manifesting over his head. The stars and most of the detailing is a fusion of Koschei from Hellboy and Barragan from Bleach, as both look like the best influences for an immortal wizard.